Holiday Shipping Guide for 2017! Please refer to the map below to see which zone your state is in. (ie AZ is yellow, NY is orange). After the 16th of December 1:00 PM MST you may wish to call us for shipping suggestions. Call Curtis at 1-866-824-9778. *Peak-season guarantees: Commitment times for air and international shipments delivered within the United States and Puerto Rico will be extended by 90 minutes on the following days: Nov. 27, Dec. 18–24 and Dec. 31. International air shipments picked up or delivered in the United States are guaranteed throughout the holiday season. The guarantee for all U.S. air services and UPS 3 Day Select® is suspended for shipments picked up on Dec. 21, 22 and 23. The guarantee also is suspended for UPS Ground and UPS Standard packages picked up or scheduled for delivery between Dec. 13 and Dec. 24. For further details, visit ups.com for UPS Tariff/Terms and Conditions. 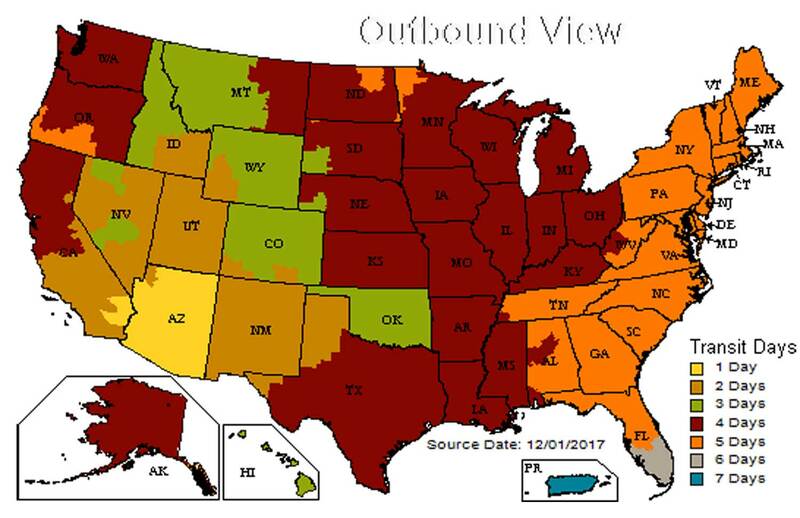 The preceding map represents UPS time in transit information for all UPS shipments this holiday season. Find your states color and check the color coded box at the lower right of the country map. Please keep in mind that the days indicated are business days not including weekends. So if a package which takes four days to deliver is shipped on Wednesday it will not arrive until Tuesday of the following week. When estimating the shipping time please allow 1-2 days for processing . If in doubt about your order please contact us (1-866-824-9778) and we can give you a definite shipment day and recommended shipping method. If the shipping method chosen will not get your order to you in time we will contact you via email or the telephone.